Something to consider while waiting for the F-Pace SVR, perhaps? Super SUVs are all the rage right now and by the end of the year we should have, among others, the , , and the – all featuring powerplants capable of well over 500 horsepower. While we await the latter of these, German tuner Hamann has developed an upgrade package for the British crossover, which currently comes with 380 hp in its most potent form, the supercharged F-Pace S.
Utilizing the same V6 that’s found under the hood of the S, Hamann has managed to squeeze an extra 30 horses, resulting in an output of 410 hp and 376 lb-ft of torque. The diesel variant also gets the Hamann treatment thanks to a remapped ECU and multi-flow exhaust, with output increased from 300 hp and 516 lb-ft of torque to 340 hp and 575 lb-ft of torque. Married to the performance upgrades is a slick new aerodynamic body kit that Hamann described as “unmistakable.” Featuring a menacing front end with front fender extensions and redesigned rear diffuser, the new body parts are complemented by a set of bespoke 23-inch “Anniversary Evo II” lightweight alloys that come in Hyper Silver, Black or Graphite Gray. A smattering of custom interior parts, including motorized aluminum footrests, rounds off the upgrade package for the Jaguar F-Pace. Interested parties will have to contact Hamann directly or get in touch with one of its dealers to find out the price of the upgrades. 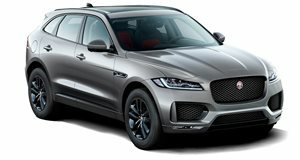 Here's a look at a regular F-Pace while you make up your mind.